– Not allow to return which is already Returned. Once user will click on “Return Products” button from Main POS Order, it will open new window with all lines like below. As we can see there is no “Return Products” button available into “Return Order”. This is an example that after creating “Return Order”, there are only few products exist. 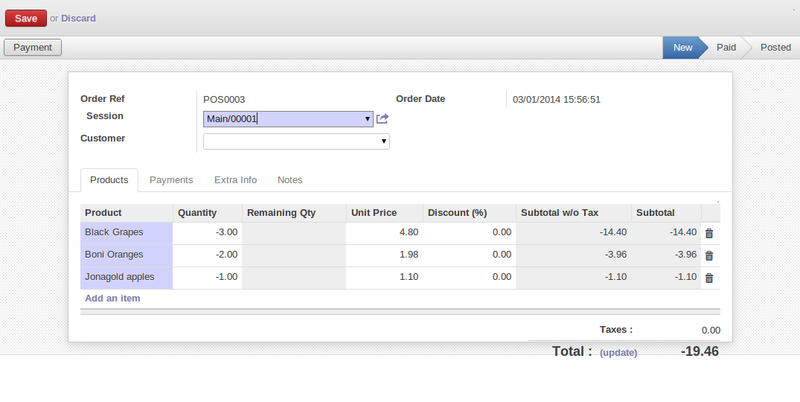 After creating “Return Order”, we can check Remaining Qty into main POS order. We are restricting user here for adding more quantities than what is Remaining in Main order. User can not add new products into “Return Order”. User will get following message when trying to save “Return Order” by modifying column other than “Quantity”. After returning all products from Main POS Order, “Return Products” button will be disappear.